Umog gra-Marad is an Orc who lives in the Imperial City Temple District with her husband, Graman gro-Marad. She works as the night guard at Umbacano's Manor in the Talos Plaza District. She can be bribed to leave her post to go have a drink at The Tiber Septim Hotel, which can be a good method for thieves who need to break into Umbacano's Manor undetected. She wears chainmail armor, a cuirass, greaves, gauntlets and boots. She is armed with a shortsword of embers and carries a spare set of clothing which she will wear when sleeping, a brown shirt and light brown linens, her house key and also has some gold. Speaking to Umog gra-Marad for the first time will have her state her name and her occupation; "My name is Umog gra-Marad. I'm employed by Master Umbacano as a night guard." 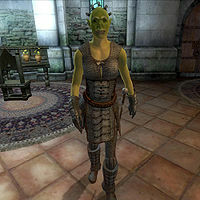 Asking her about the Imperial City will have her reply; "You'll find a lot of orcs serving as private guards. Watch work is too dull. Lots of folks say, 'Oooh, there's an orc, she's scary'. Makes it easy." Asking her about her employer, Umbacano, will have her boast about her abilities as a guard: "I keep an eye on his place. Stuffed full of treasure, you know? But no dirty thief's getting in while I'm on duty." Asking her the same question after Umbacano is killed during the quest Secrets of the Ayleids, and your disposition with her is below 75, will have her mention that he seems to have disappeared: "You know, I haven't seen him around for a while. But I'm still getting paid, so what do I care?" If you are on friendlier terms with Umog gra-Marad and ask her about Umbacano after he disappeared will have her mention that she sometimes abandons her post: "You know, sometimes I get thirsty during the night shift. Duck out to the Tiber Septim for a quick drink. Not like anyone would notice. I mean, what are the chances a thief would choose that moment to try to break in?" If you make a remark implying that she shouldn't abandon her post guarding the manor she will be angry at you for claiming she is bad at her job: "Just making conversation, buddy." If you mention that the Tiber Septim Hotel's prices are quite high she will agree with your claim: "Damn straight. I can only treat myself when I'm feeling flush." If you say that you'll consider giving her the money to go out for drinks she will be pleased with your promise: "Sure, sounds good. See you around." If you instead offer her 100 gold to go out for drinks she gladly take you up on the offer, abandoning her post to go out drinking, but not before saying: "You're a real friend of the working stiff, you know that? Maybe I'll see you there tonight, and we can drink to your generosity." Although possibly unaware, Umog has an admirer in Uzul gro-Grulam, even though she is married and Uzul is courting Myvryna Arano. When asked about the Imperial City, Uzul will proclaim his admiration, saying: "Hard to find an Orc girl in this city like Umog gra-Marad. Smart, tough, got a good trade. Nice-looking, too. So I got to make my intentions clear."